Pebble Beach is well-known to even the most casual golf fans. It’s short on the scorecard for a par 72, but the combination of natural hazards, extreme elevation changes, and prevailing winds really limit most golfers off the tee. Despite being the shortest course on Tour, the 2nd shots here are as long as at an average course and they’re targeted at tiny, well-bunkered greens. There are opportunities for aggressive play off the tee here – Dustin Johnson out-drove his closest competitor by 12 yards in last year’s 4th round by pulling driver when others were laying-up – but this course is very much a 2nd shot golf course. Spyglass also plays much longer than its scorecard length because for the most part the par 3s play downhill and the par 4s play uphill. The 2nd shots here also require precision to small greens. The Shore course plays mostly exposed along the coast. The four par 5s provide scoring opportunities, and in general the fairways are spacious. All three courses have poa annua greens; Pebble Beach in particular regularly has the most difficult to putt greens on Tour. These are the guys who have played best here relative to their typical performances. In other words, for each year they’ve played I’m comparing their Pebble Beach performance to their average performance for the year (minimum 4 starts here since 2008 including the US Open). Dustin Johnson’s success here is well publicized – not only his back to back wins in this event, but the first three rounds of the US Open in 2010 and three other top tens. Looking at how he’s played the course, he has the right amount of power to take advantage of certain holes – hit over the mid-fairway bunker on #15, smash it up the hill on #11, drive the green when the tees are up on #4, etc. Lots of guys play this course very cautiously – hitting fairways so they can control their shots into the tiny greens. My estimate is that the pros used driver only about 60% of the time last year versus 70%+ on an average course. I have written a lot about predicting putting performance. 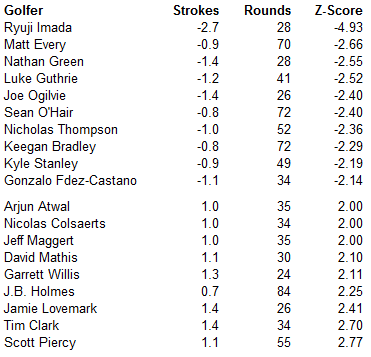 I’ve found that 1st round putting performance provides no information to predict 2nd round putting performance. I’ve found that players who improve their putting at the beginning of a season tend to retain little of that improvement going forward. I’ve found that putting improvements driven by making more long putts tend to disappear the following season because making long putts is largely a matter of luck. I’ve found that putting performance over a quarter of the season provides almost no information on how well a player will putt in the next quarter of a season. All of these studies indicate that putting performance is highly affected by luck. What I have not done is test the influence of very recent putting on one week of putting performance. 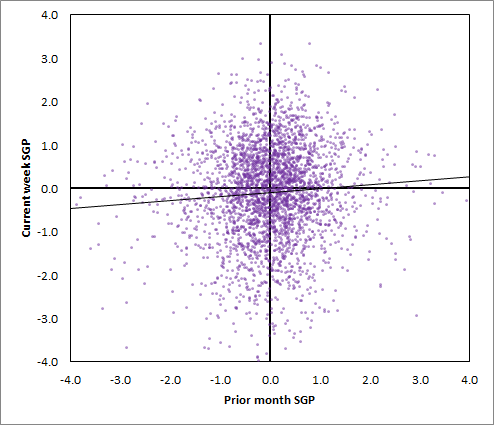 If one believed that putting came in streaks – perhaps someone got “hot” or “in the groove” for a few weeks before returning to normal – you would expect very recent performance (prior week or prior month) to have a strong impact on putting performance in the current week’s event. As I’ll show, that is not the case. My results over several different methodologies again show that short-term putting is driven mostly by luck and that recent putting performance provides almost no information on how well a player will putt going forward. I collected the following data from 2011-2015 for all qualifying PGA Tour golfers: 1. their average putting performance in strokes gained versus the field over the previous three seasons (2008-2010 for 2011, 2009-2011 for 2012, etc. ), 2. their putting performance in the month prior to every event they played, 3. their putting performance in the week prior to every event they played, and 4. their putting performance in each event they played. I ignored majors and Tour events outside the US for which strokes gained data was not available. Once I had matched that data for every qualifying golfer for each tournament they played, I discarded any data points for which the player had not played the week before. These two samples of performance (played prior week and did not play prior week) were not different in a statistical sense. 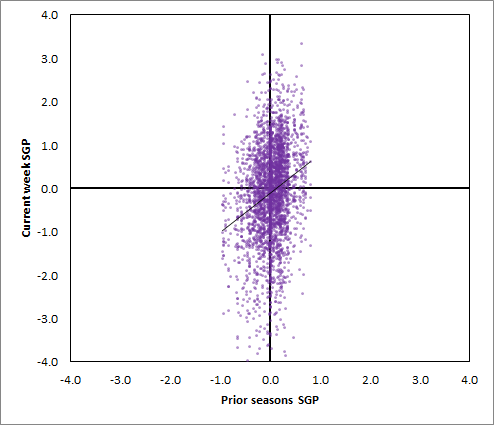 Each data point contains putting data from 1. prior seasons, 2. the prior month, and 3. the prior week. I had nearly 3100 pairs of tournaments to compare. 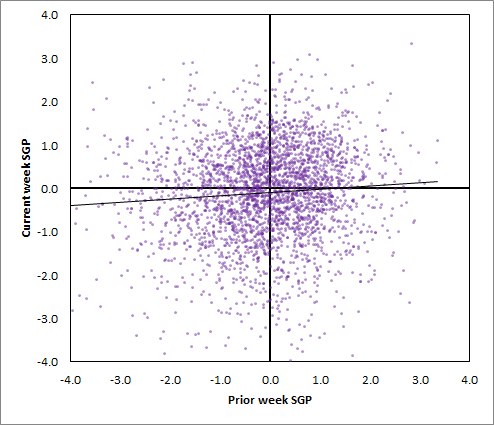 Just comparing performance in the prior week to the current week yielded almost no predictive value (R^2 = .006). For every stroke better than the field a player putted in the prior week, they’re expected to putt 0.08 strokes better in the next week. Using the same 3100 pairs of tournaments and comparing performance in the prior month to the current week again yielded almost no predictive value (R^2 = .006). For every stroke better than the field a player putted in the prior month, they’re expected to putt 0.09 strokes better in the next week. Using the same process and comparing performance over the previous three seasons to the current week yielded more predictive value (R^2 = .057). For every stroke better than the field a player putted over the previous three seasons, they’re expected to putt 0.91 strokes better in the next week. This indicates that when attempting to predict putting performance, how a player has putted in the previous few seasons provides about fourteen times more information than how they have been putting recently. Putting performance is almost entirely driven by how well a player putts in general, rather than any hot or cold streak in recent weeks. Looking at the field this week, Nick Watney sticks out as a guy whose poor putting has cost him recently. Of players with at least 6 rounds of putting data in 2015, Watney is 2nd to last despite being generally a fairly average putter by the numbers. Poor putting likely cost him at least a spot in the playoff at Torrey Pines on Sunday. Kevin Streelman’s putter has also been cold to start the season – he’s putted about half a stroke worse than expected over his first four events. He’s wasted three strong tee to green performances at Kapalua, Waialae, and Scottsdale by putting poorly, and managed only a T30 as his best finish there. After a final round where the winner was in doubt throughout, Jason Day emerged as the winner of the four man playoff to win at Torrey Pines. Day went for the green in two at 18 in regulation and again in the playoff, making par the first time to stay at -9 and making birdie the second time advance in the playoff. Runner-up J.B. Holmes did not go for the green in regulation, and after a good wedge in, missed a downhill birdie putt to win. The immediate reaction from myself & others on Twitter was that Holmes should have gone for the green because it gave him a better chance at birdie. I’ll try to provide some context to why he played a lay-up and also what the numbers say in that situation. This was Jason Day’s first stroke play win since 2010. Day’s been generating monster performances now for the last two seasons – despite injuries sapping much of 2014 – and he’s always looked right on the edge of something truly special. Perhaps that starts this season. Day’s game is built around his effortless power off the tee, but on these tough courses his short game really shines through. He scrambles with the best on Tour and his putting is outstanding; that gives him something to lean back on when the field is only hitting ten greens a round. He hit some ridiculously good shots on Sunday tee to green, but he was also 5/5 in scrambling. He talked about how he “liked to grind it out” in his post-tournament presser. I’m not sure there’s anyone else better at doing that right now. This sets Day up for an enormous year. Right now, he’s in that elite group at the very top who are the favorites whenever the big guns tee it up together. 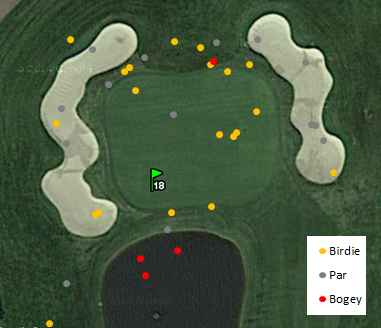 J.B. Holmes sat in the middle of the fairway on 18 at -9, with 235 yards to the pin. Scott Stallings and Day were in the clubhouse at -9 and Harris English could get to -9 as well with a birdie on 18. Holmes needed a birdie to win outright; a par would only earn him a 1/3 or 1/4 shot in a playoff – with the defending champion and another clearly superior player. Holmes eventually chose to lay up, claiming the lie wasn’t ideal and that he was afraid he’d hook it long and left. With the lay-up, Holmes still had about a 1/4 chance of birdie. He spun a wedge to 19 feet and rolled his birdie putt just past. On a typical par 5, it would be lunacy not to go for the green from 235 yards in the fairway. Tour pros go for that shot about 90% of the time and are rewarded with birdie about 55% of the time. 18 at Torrey Pines seems like an atypical par 5 though. Hit enough club to carry the water just short of the pin and you risk rolling it into the thick rough long. That earns a wicked downhill chip that (as we saw with Jason Day) brings the water into play. The question becomes, does going for the green in two earn a significantly better chance at birdie, at least enough to outweigh the chance of making a bogey by hitting it into the water either on the 2nd shot or the 3rd shot. Based on data from Sunday, 17 pros went for the 18th in two shots. Eight players made birdie, eight made par, and one made bogey after a three putt. That 47% birdie rate right there is pretty damning to Holmes’s decision. The positions those 17 players attacked the green from were very similar to Holmes – an average of 239 yards to the pin and 14/17 in the fairway. In fact, Holmes was one of only three guys to lay up from inside 245 yards in the fairway all day. Last year, 12/21 players (57%) made birdie after going for it in two. It seems like a reasonable assumptions that the result of Holmes’s 2nd shot would be similar to those 38 other players who went for it from similar positions. I could also adjust the expectations based on Holmes’s ability on long approach shots vs. wedge shots, but he’s equal on those based on my shot by shot numbers from the past year. I’ve plotted the results from 2014 & 2015 below. Birdies in gold, bogeys in red. Hitting the green yielded birdie 6/7 times, long in the rough yielded birdie 6/11 times, long left yielded birdie 2/5 times, short left 3/4 times, right of the green 1/5 times, and short of the green 2/6 times with three water balls. In short, pretty much anywhere Holmes hit his 2nd shot he was more likely to make birdie than with a wedge from 100 yards. And only one player out of 35 who carried the water made bogey. I think it’s pretty clear Holmes made the wrong play here. Making tactical errors in situations like this are very common on Tour because players get fixated on the information that easily comes to mind – I’ve hooked long approach shots before, Lucas Glover hit the water right before me, I hit a wedge to 10 feet last year (which Holmes did to this pin position). They fail to realize that a handful of shots provide far less information than the results of the other 155 players in the field. The outcomes of the 38 guys who went for the green in two over the past two years provides FAR more information about the possible outcomes of your own shot. Part of using numbers in golf is knowing what is likely to happen if you hit an average shot from a given lie and distance. While the differences between Tour players may seem magnified in terms of outcomes (money, wins, FedEx points), they’re all within in pretty narrow range of golfing ability. This means you can generalize potential outcomes for most shots similarly to what I’ve done above and choose a strategy from there. In Holmes’s case, he went from nearly 50% to birdie if he went for the green to about 25% to birdie by laying-up. I have him at above 60% to win if he goes for the green and about 48% to win if he lays up. In terms of earnings, he cost himself about $100,000 by laying up. Dual course event this week, but Torrey Pines South will be used for three of the four rounds. Torrey Pines North is a much easier venue – by around three strokes/round – largely because it’s almost 600 yards shorter at the same par 72. The par 5s are all scoring holes – unlike at the sister course to the south. Torrey Pines South is a stiffer test. It’s the longest course the Tour visits in scorecard length, and it plays as one of the longest if you look at average approach shot distance. It’s particularly long when you focus just on par 4 length (only Valhalla (PGA Championship) and PGA National (Honda) challenged it last year). The rough is nasty here; it played nearly the most difficult on Tour last year. This is a course that requires the game that most elite players possess – long enough to score on the long par 4s and par 5s, accurate enough to not live in the rough, and good with the mid and long irons that almost every hole requires. Jordan Spieth has been the best golfer in the world since October (minimum 16 rounds), with wins in Australia and at Tiger’s event and a back-door top ten in Phoenix last week. Spieth started last season hotter than just about anyone, but fell off towards the summer because he completely lost his game off the tee. In 2013, he combined above-average distance with nearly the most accurate tee shot on Tour and ranked in the top ten in performance on drives. Beginning at some point last spring/summer, he started spraying it everywhere off the tee, costing him a huge amount of his advantage on drives. It’s only one tournament of data, but last week he was great off the tee – gaining about a stroke/round on drives and hitting it as straight as in 2013. Shane Lowry making a rare US start this week. He’s a guy most PGA Tour fans won’t be that familiar with, but last year was his first big year on the European Tour. He started off ridiculously cold missing six of eight cuts, but contended all the way in the European flagship event in May. From May onward he played at the level of a top 20 golfer in the world and hasn’t missed a cut since June. No clue how Lowry will do in his first start at Torrey Pines, but he’s a legitimate contender in this field at the level of Harris English or Marc Leishman. These numbers are illustrative only, but these are the best and worst on long courses since 2010. Long courses are the top 25% of PGA Tour courses in average approach shot length (these include Torrey Pines South, PGA National, & Congressional) and this is performance with putting removed. 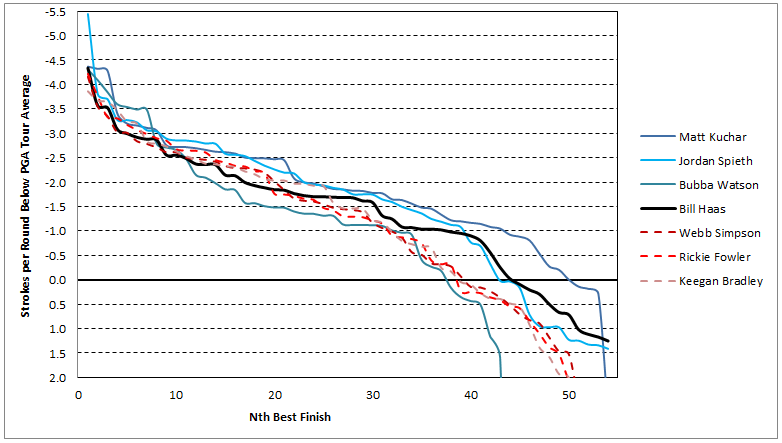 I’ve compared performance on long courses to performance in all others rounds. The 219 golfer sample yielded 19 golfers with statistically significantly different performances (negative z-scores below indicate better performances on long courses). 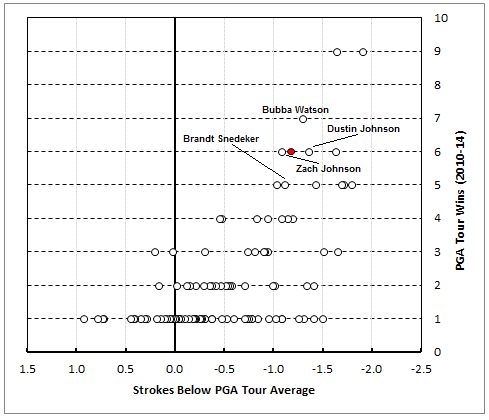 On the positive end, Keegan Bradley and Kyle Stanley are the most notable to play much better on long courses. On the negative end, Tim Clark and J.B. Holmes struggled the most on long courses. Doing the reverse analysis and measuring performance differences on the shortest 25% of courses reveals some of the same names. 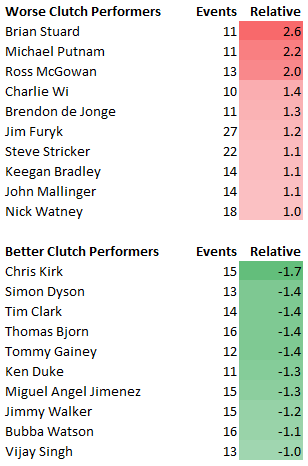 Graham DeLaet and Kevin Na stuggle most notably on shorter tracks, while Jason Day stands out as by far the most extreme in favor of short courses. Now, those numbers just use aggregate performance on all strokes and are surely distorted by all kinds of random variation. However, it makes sense that golfers who play better on longer courses would hit their long irons better, while those who are better on short courses hit their wedges better. Looking deeper at shot-by-shot stats over the past year, DeLaet, Stanley, and Bradley all hit their mid to long irons much better than their wedges, while Tim Clark and Jason Day both have huge splits in favor of hitting their wedges better. The only player whose stats don’t back up his performance is J.B. Holmes. These are the guys who have played best here relative to their typical performances. In other words, for each year they’ve played I’m comparing their Torrey Pines performance to their average performance for the year (minimum 4 starts here since 2008 including the US Open). Brooks Koepka is your winner. No one else covered themselves in glory down the stretch, though. Martin Laird hit two awful tee shots on 17 and 18 to ruin a weekend of clutch putting, Matsuyama missed almost every putt down the stretch, and Bubba couldn’t make birdies on the par 5 15th or drivable 17th. Koepka’s eagle from off the green on 15 was the decisive blow and he held on with two bombed drives to set up pars on 17 and 18. Adam Sarson has the recap and the GIFs (including a borderline NSFW drive by Koepka on 18). Koepka’s pretty anonymous to casual golf fans, but he’s been lurking on the edges for at least the last year waiting to breakthrough in the US. Did you see the final round? Oh yeah, CBS didn’t show his shots until the 16th hole. Anyway, he puts immense power behind the ball, generating some of the fastest club head speed on Tour. He can hit driver as far as anybody on Tour. He was pretty wild last year, but he’s straightened things out through the first few events this year. When you can hit it 310 with accuracy, well, that’s Rory McIlroy territory. He started last season pretty cautious off the tee, hitting three wood a lot on unfamiliar courses. Towards the end of the season and into 2014-15 he started hitting driver more often and he’s really reaped the rewards. Since August, only Rory, Bubba, and Lucas Glover have played better on tee shots. Koepka’s not a one trick pony though; he was well above Tour average last year on iron/wedge shots and is extremely aggressive in going for par 5s in two. He also hasn’t shown any deficiencies with the short game.And through about 70 measured rounds, he’s putting solidly above average. In short, this kid hasn’t really shown ANY weaknesses. Koepka graduated from Florida St. in 2012 and started playing on the European minor league tour soon after, winning four times by the summer of 2013 and earning his European Tour card. He made a cameo alongside Tiger Woods in the final round of the 2013 PGA Championship, then spent the 2013-14 season bouncing between European and PGA Tour events, eventually earning his PGA Tour card. He finished top ten in his first two starts as a Tour cardholder, then got his first big time win in Turkey last fall. The European Tour named him Rookie of the Year soon after (and made this awful video to celebrate). Koepka was putting up great finishes almost from the beginning. His 2012 half-season was played at PGA Tour average, and he kept up the pace in 2013 – posting a top 75 season despite making starts on four continents. He jumped into the top 50 in my ratings last September. This win moves him to 19th in the OWGR (I have him around 30th best in the world). Full-speed ahead right now for Koepka. In 2.5 seasons, he’s already won two big tournaments, finished top ten at a major, and jumped into the top 20 in the world. He’ll be at all the majors this year (his game sets up perfectly for Augusta by the way), looks like a good bet for the Presidents Cup team, and could easily contend a few more times this year. What struck me most about the win was how nonchalant he was about it. He’s not a young kid with stars in his eyes, just happy to have a win and rest on his laurels; it’s obvious he expects to win every time he tees it up. Laird blocked his 5 wood into the gallery on 17, ruining his chance of birdie and actually leading to bogey. He stood on the 18th tee one back and watched Koepka bomb it 320+ down the middle of the fairway. From that position (~115 in fairway), Koepka makes at least par over 90% of the time. If you want to win you have to play whatever shot leads to birdie most often. Laird had hit 5 wood on this tee shot in the first three rounds (fairway/rough/fairway) and made two pars and a bogey. The Tour pros on average make birdie on ~13% of their holes from where his 5 wood would’ve ended up on average, versus about 18% of their holes from where his driver would’ve ended up. The choice is pretty clear then – 5 wood wasn’t putting him in position to make birdie on that hole. He then hooked his drive well into the water and had no chance. What’s most interesting is that Laird is actually pretty long off the tee (he can hit driver about 300 yards) and could’ve put himself down to about 130-140 yards. However, he spent the whole week in Phoenix laying up off the tee (more than all but one pro who made the cut and way less than Koepka and the other leaders). He had relied on his putting and short game to that point. Perhaps he wasn’t confident in driver or perhaps he didn’t like the new bunker positions, but he gave away fractions of a stroke off the tee all week and it finally caught up to him when it mattered. This is the first tournament played on the newly renovated TPC Scottsdale Stadium course. Beyond the visual upgrades (new bunkers, re-seeded greens/fairways/rough, new cart paths, etc. ), several green complexes were completely re-done and the 14th was lengthened into a 490 yard beast of a par 4. Most importantly, designer Tom Weiskopf completely altered the bunkering on many of the tee-shots, moving the bunkers into areas where Shot Link said the pros had been hitting their tee-shots. Bill Rand discusses some of the notable changes – including a resized bunker on 18 that will completely alter how the hole is played. Anytime a designer can make the course fresher, while also maintaining the signature stretches (15/16/17 here), it’s a win for the fans. I’m most interested this week in who adapts their tee-shot strategy and executes those shots. Beyond the changes, TPC Scottsdale is still a fairly easy course. It has played to around 69.8 on a par of 71 and is about average in length. However, it has definitely been a course where guys could step-up and hit driver on most shots. Bubba Watson in particular has played extremely well here recently because he could be aggressive and hit over the fairway bunkers. The renovated bunkering off the tee should at least force the pros to adapt their strategies. All par 5s are gettable in two shots, while the par 4 17th offers one of the best risk/reward par 4s in the game. Tiger is the story this week. Suffice to say if he’s healthy for the whole season he should be one of the best on Tour. In 2012 and 2013 Tiger played about as well as anyone has in the past five seasons and won eight tournaments. He combined top ten putting ability with his always strong iron play; there’s not really any reason to doubt that a healthy, focused Tiger can’t recreate those seasons. If so, he’ll be in line for multiple wins, Player of the Year, and dare I say possibly a major. For this week, I’m interested in the short game after how disastrous he was around the green at his event in December. That performance was a sign that he just wasn’t in tournament shape and hadn’t put enough work in. Also, what kind of distance is he able to generate off the tee? Amid the injuries last year, he lost 3 mph of club head speed from 2013 and 5 mph from 2012. The basic rule of thumb is about 2 yards per mph, meaning his max distance with driver fell by around 10 yards in two seasons. That’s worth around 2/3rds of a stroke per round; regaining some of that distance is critical for him to remain an elite player. In the same vein, Tiger started laying-up a ton off the tee in 2013. 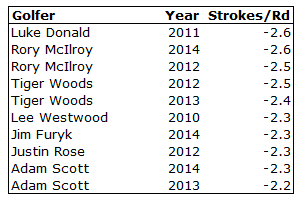 He went from about Tour average in laying-up in 2012 to one of the most likely to lay-up in 2013. Whether it was not trusting his swing with driver or some sort of physical issue, he can’t afford to lay-up on 1-2 extra holes each round – especially if he’s not hitting driver 295 anymore. Looking beyond Tiger, this week is the stateside debut for Rickie Fowler. Fowler’s game was clearly the most improved last year after reworking his swing with Butch Harmon. Mark Broadie wrote on Golf.com in October that Rickie Fowler gained 7 yards off the tee in distance over 2013 – largest on Tour. He also became more aggressive off the tee and jumped from 60th to 13th in terms of how often he went for a par 5 in two. He won’t putt like he did in the summer (over 1.0 strokes gained/round), but in his last six tournaments of the year he improved by a full stroke versus the field on tee-shots/approach shots/short game. These are the guys who have played best here relative to their typical performances. In other words, for each year they’ve played I’m comparing their Phoenix performance to their average performance for the year (minimum 3 starts here since 2008). Among the favorites, Bubba has typically killed it here – even without lucky putting – and Gary Woodland has been very strong as well. Bill Haas won the Humana Challenge Sunday, holding off a host of others to win his sixth PGA Tour event. Despite those six wins and a FedEx Cup title, Haas still has a fairly low profile. In fact, Haas wasn’t even listed among the PGA Tour’s Top 30 Golfers to Watch in 2015 – despite finishing 15th and 16th in scoring in 2013 and 2014. I’m going to take a look at two of the most defining factors about Haas and then try to figure out his deserved place inside the Tour’s hierarchy. Last season in 28 starts on Tour, Bill Haas made 27 cuts – withdrawing only once at the Heritage with a wrist injury. Using my ratings which adjust performance based on strength of field and difficulty of the course, Haas only played poor enough to miss the cut 19% of the time since 2013. That’s better than Dustin Johnson, Keegan Bradley, Jordan Spieth, and a host of others more highly touted. Why Haas doesn’t get much attention is because he results have mostly fallen in the middle – that is, he’s avoiding missing the cut, but also failing to finish near the lead more than everyone in his peer group of fifteen similar golfers other than Bubba Watson. I’ve attached a chart of some of those golfers compared to Haas below. It plots each tournament finish in order of performance relative to the field. You can see that Haas’s black line has comparatively much better bad performances, but he hasn’t reached the heights that most other near-elite guys have in their best outings. In the last two weeks, I’ve discussed how Patrick Reed’s results look a lot different than anyone else who are considered top players on Tour. Reed has won in four of the ten times he’s finished top ten, but also played poorly in an alarming number of weeks. Haas, on the other hand, produces the results week-to-week that we see from other near-elite golfers, but hasn’t been in contention nearly as much as those other near-elite golfers. Adam Sarson included a chart of Haas’s finishes in majors in his Humana recap. Long story short, they’re not very good. Haas has been eligible for 19 of the last 20 majors, but has only six top 25s. His results haven’t necessarily been bad – of the 150 golfers with at least 20 major rounds since 2010, he ranks 36th in adjusted scoring average – but they haven’t reached the near-elite level he’s played at in regular Tour rounds (19th during that span). Is there any rhyme or reason to this? Perhaps, but this is a guy who has closed out six PGA Tour tournaments (including at three difficult classic venues – East Lake, Riviera, and Congressional) and executed maybe the most ridiculous shot in recent memory to win $10,000,000. It’s really easy to look for reasons why golfers don’t perform at majors, but you can quickly tie yourself up in narratives. Haas’s under-performance during 2010-14 ranks 113th out of 150 golfers, meaning he played 38th worst relative to how he plays in normal Tour events. However, a few spots behind him is multiple major winner Vijay Singh, major winners Zach Johnson, Justin Rose, and Webb Simpson are right around Haas, and Jordan Spieth is behind him. It’s correct to say Haas is the best golfer to never contend in a major, but there’s certainly no reason to expect him not to be there in the future. Since 2010, Haas in one of seven golfers to win six events on Tour and one of only twenty to win at least four times. On the below chart, Haas is the red dot among every golfer to win at least one tournament during 2010-2014. Performance relative to the field in all tournament 2010-14 is on the x-axis. Not only is Haas’s aggregate performance near the top guys, but his six wins compare very favorably to Dustin Johnson and Bubba Watson – among others. Popular perception of golfers is driven almost entirely by their major wins or possibly near misses. Obviously winning a major is important, but with only four a year and with dozens of good golfers competing for them, it’s important to not lose sight of guys like Bill Haas who have built ridiculously impressive careers based consistently making cuts, finishing in solid positions, and winning most years. A trio of easy resort courses are in play this week – PGA West (Palmer), PGA West (Nicklaus), and La Quinta CC. This week is typically the easiest scoring week of the year for the pros. Expect a lot of fairways hit, a lot of wedge approach shots, and a lot of birdies overall. It’s tough to do anything regarding course form here as the event courses have changed a lot over the year; perhaps most important for the pros is being able to deal with the pro-am format while still staying in the competitive zone. This marks Phil Mickelson’s 2015 debut and his first start since he bowed out of the Playoffs early in September. A lot has been written about Phil’s down season last year and what it means for his career and his performance going forward. However, a lot of that “down season” stuff is solely based on him not winning a tournament for the first time since 2003. 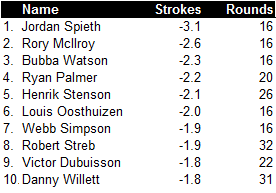 And yeah, the big results weren’t there (though he had two 2nds), but his overall performance was only down slightly from 2011-2013 – mostly because he wasn’t sinking essentially every putt. The expectations for him week to week on Tour are ridiculous; he’s more like the 20th best player in the world and it’s completely normal for that guy to go a year without winning. Over the past few years, Phil has lost a ton of club head speed. Five years ago he was 13th on Tour in driving distance and in the top 10-15% in terms of driving performance on Tour. Last year he was 70th and basically average in driving performance. This is entirely normal for a golfer in his mid 40s and he’s responding the right way by trying to get in better shape. We’ll see if it translates at all to his performance this year. He’s also been one of the most aggressive in terms of using driver on holes where others are laying-up. This week also marks Jason Dufner’s 2015 debut. He was sidelined from August to October with a neck injury after having a disappointing 2014 season. However, he returned in a three week Asian swing where he played more like he had been playing in 2012-13. The most important question for Dufner going forward revolves around his putting. In the past six seasons he’s had three mostly average putting years by Strokes Gained Putting and two disastrous years. When he putts at an average level, his ball-striking makes him a clear top 25 player. When he putts as poorly as last season, he’s simply not a factor. Last year he was only in contention once in sixteen events after something like nine or ten times in 48 events in 2012-13. That all comes down to whether he can not be awful on the greens. I wrote about Patrick Reed after he won the Hyundai ToC two weeks ago, saying he displayed a very wide spread of results and especially way more wins than his aggregate performance suggested. Most ridiculously, he has four tournament wins, but only six other top tens. Dividing his results into three groups – good (around top 10 and better), average, bad (missed cut or low finish in the money), he’s at 33% good, 30% average, and 37% bad since 2013. The average spread for guys who are approximately as good as he is is 25% good, 43% average, and 32% bad; instead of those average results he’s racking up some really good performances and some really awful performances. Now, this could be part of his game or it could be just how the chips have fallen in ~50 tournaments. I ran the same numbers for golfers of similar talent to him for 2011-12 and compared their percentiles to their results in 2013-14. First, Patrick Reed’s results were more extreme than any of the ~75 golfers I compared him to. He had about 12% more good performances than he should’ve based on his talent. Looking ahead to 2013-14, the golfers who had more good performances than they should have still had more good performances, but only slightly. For every three “extra” good performances they retained only one “extra” good performance in 2013-14. Applying that to Reed, we should expect him to fall more into a bell-curve like performance distribution with fewer extreme tournaments, and more average ones. The interesting question is whether Reed’s aggregate performance is dragged down by him playing especially poorly when he’s not in contention. I examined whether golfers “gave-up” in the fall and concluded that there was only evidence of “giving-up” for golfers who were 10 strokes behind starting the 2nd round and 15 strokes behind starting the 4th round (ie, guys who are going to miss the cut and guys who are locked into 65th place). Golfers in those places play, on average, between 0.25 and 0.5 strokes worse than normal. Reed’s results are very extreme. When he starts the 2nd round within five strokes of the lead he’s played 1.1 strokes better than expected. When he starts the 2nd round in any worse position he’s played 0.6 strokes worse than expected. That certainly explains why he’s missed so many cuts. Looking deeper, the same phenomenon occurs in the 3rd round where he plays well near the lead, but not when far off the pace. In the 4th round though, the trend completely reverses and he plays slightly worse near the lead, but way better when far off the pace. It’s impossible to conclude anything about his motivations from this analysis of ~60 tournaments; it’s just not very much data and easily influenced by chance. I’m sure I could find similar results from other golfers. It does, however, go some way towards explaining why his performances have tended towards the extreme. These are the guys who have played best here relative to their typical performances. In other words, for each year they’ve played I’m comparing their Humana/Bob Hope performance to their average performance for the year (minimum 3 starts here since 2008). Again, these are polluted by putting luck and there are multiple course histories represented. Is Going Low a Skill? Winning a PGA Tour tournament normally requires besting the field average by 12-15 strokes. However, Tour courses vary widely in difficulty between the US Open tracks which normally play several strokes over par and the easier resort style courses which can play several strokes under par. On the former, winning scores hover around par, while on the latter it often takes -25 under par to win the tournament. On difficult courses making mostly pars puts you in contention, while on easy courses a golfer needs to make a lot of birdies to even have a chance. What I was interested in is whether certain types of golfers perform better on difficult or easy courses. That is, are golfers who make more birdies than the field better set to tackle courses where you have to go low? And are golfers whose games are built on avoiding bogeys a better bet on hard courses where you have to grind for par? My research showed that there was a small affect in each direction, but one that doesn’t significantly impact most golfers’ results. To set-up my study I collected the results for every golfer who played a qualifying number of rounds on the PGA Tour in 2013 and 2014 (~360 golfer seasons). I then adjusted their rates of birdie holes and bogey holes to account for the courses they played each season. In most cases the adjustments weren’t significant, but the better golfers tend to play harder courses and the worse golfers tend to play easier courses (there is positive relationship between the prestige of the tournament and the difficulty of the course). That yielded a relative birdie% and relative bogey% for each golfer. By subtracting bogey% from birdie%, you can find how dependent each golfer is on making birdies versus avoiding bogey for their scoring. Last year, Rory McIlroy ranked 1st in birdie% and 4th in bogey%; he was more dependent on making birdies for his scoring. Jim Furyk ranked 39th in birdie% and 1st in bogey%; he was more dependent on avoiding bogeys for his scoring. I divided every golfer into one of six groups depending on how dependent they were on making birdies or avoiding bogeys. I’ll refer to those dependent on making birdies as Birdie Generators and those dependent on avoiding bogeys as Bogey Avoiders. I then gathered the course specific scoring averages for each event, adjusted them by the quality of the field, and compared them to each courses’ par. For example, at the Sony Open in 2014 the field averaged 69.3, the field was 0.3 strokes worse than PGA Tour average, and the course par was 70. Adding all that together, an average field would have played that course in 1 strokes under par (70-(69.3-0.3)). For the 2014 Masters, the field averaged 73.95, the field was -0.3 strokes better than PGA Tour average, and the course par was 72. An average field would have played that course in 2.2 strokes over par (72-(73.95+0.3)). I then divided those courses into four groups based on their average difficulty; Easiest (>1 stroke under par), Easy (0-1 stroke under par), Hard (0-1 stroke over par), and Hardest (>1 stroke over par). Read the chart with more negative values indicating better performance. The “Difference” column indicates the difference between performance on the easiest courses and hardest courses. Negative values indicate golfers in that group performed better on the easiest courses. The results indicate that the most extreme Bogey Avoiders perform almost 0.2 strokes worse on the easiest courses relative to the hardest courses. The most extreme Birdie Generators don’t display the reverse, but with only eleven golfers, those results may reflect randomness because the next two less extreme groups of Birdie Generators definitely perform better on the easiest courses. However, the results also indicate these values are not impacting tournament results for most golfers. Perhaps the most extreme Bogey Avoiders should be downgraded slightly on the easiest courses (like at the Humana this week), while it looks like the Birdie Generators definitely do play slightly better on easy courses and slightly worse on hard courses. However, even for the most extreme golfers, playing an unfavorable courses is only worth between 0.1 and 0.2 strokes different from their regular performance – enough to shift the odds of winning by around 1% for the best golfers and by much smaller fractions for lesser golfers. Going low is a skill, but it only makes a very small impact on real-world results.